Ashley Lock peers out of the window during a district bus tour for new teachers at Ladue Horton Watkins High School, where she'll teach history. Summer vacation is ending for teachers across St. Louis. Those starting full-time teaching jobs say they’re excited and nervous. Ladue School District’s new hires began their orientation last week. Over breakfast in the middle school cafeteria, they shared the excitement and nerves of starting a new job. It’s a difficult district in which to land a job: Administrators said Ladue fielded about 200 applications for five open elementary school positions. The district filled some openings just two weeks before class begins, but other new hires, including Agnes Wypych, have had more time to prepare to teach sixth-grade language arts. 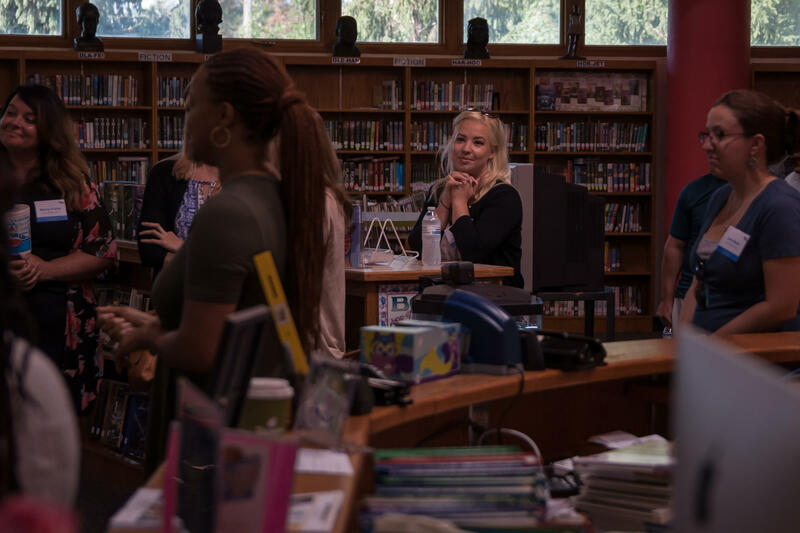 Agnes Wypych (center) listens during a tour of Ladue Middle School on her first day of orientation as a middle school language arts teacher on Aug. 2. 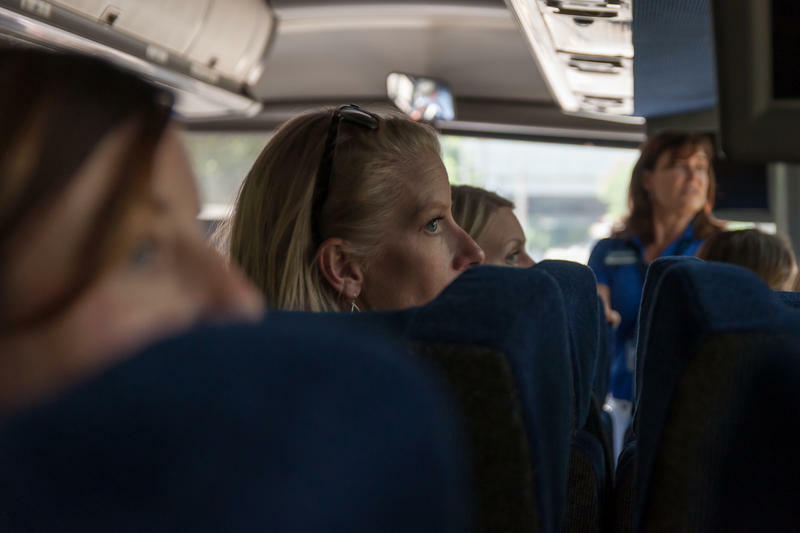 After making introductions and sharing summer break stories and, district officials loaded the teachers onto a bus to show them the boundaries and buildings of the 19-square-mile district. 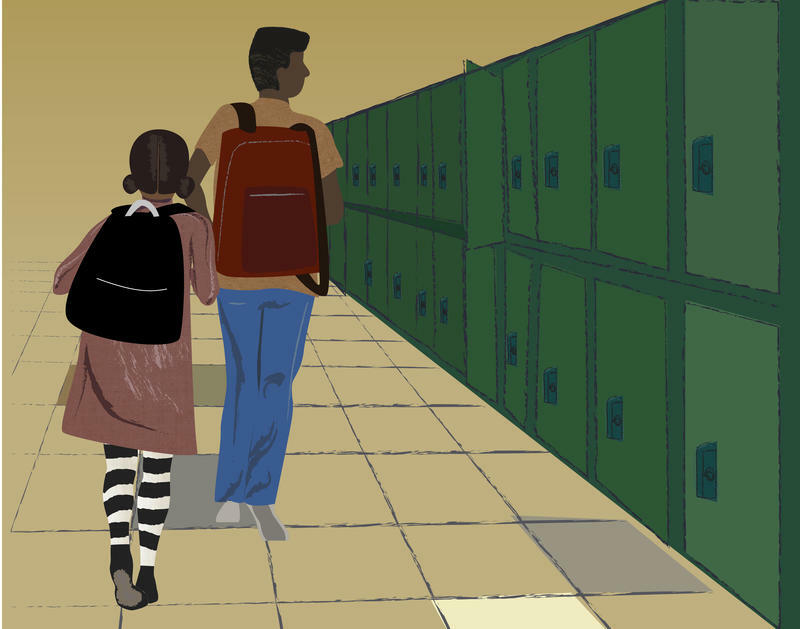 About 4,100 students from both some of the wealthiest parts of St. Louis County and some middle-class communities attend school at seven sites. 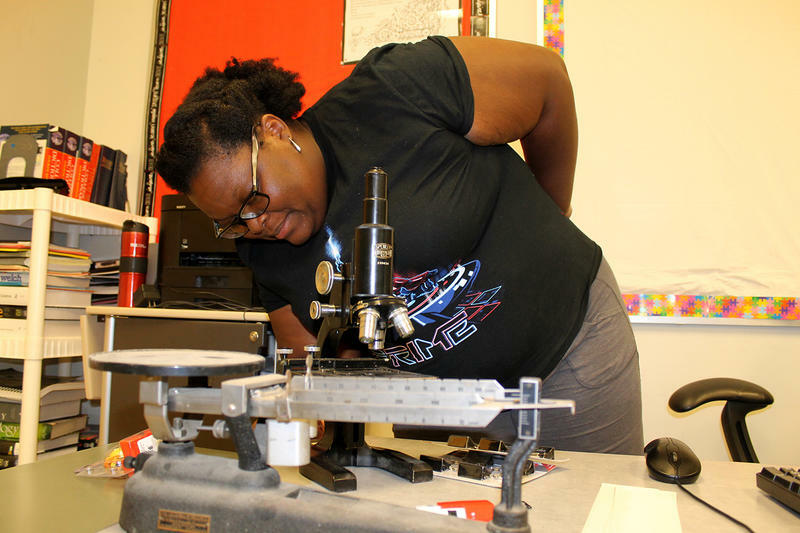 When the bus tour stopped at Spoede Elementary, Chrysten Sailor was transported back to fifth grade. A Ladue alumna, Sailor’s class picture still hangs in the hallway. “I look the same,” the 24-year-old remarked. She has memories of planting in the school’s gardens and watching her third-grade teacher do a cartwheel. “It was in this building that I decided to be a teacher because I had such amazing teachers. So I always wanted to come back here,” Sailor said, who taught for a year in Hazelwood before moving to Ladue. Being new to the district but not the profession may calm the nerves of people like Kellen Plaxco, the new Latin teacher for the high school. He taught part time at Clayton High School and is an adjunct professor at Saint Louis University and Lindenwood University. Still, “there are a lot of unknowns,” he said. “It’s sort of like bracing yourself for drinking from a firehose. Don’t think you’re going to be able to anticipate everything,” Plaxco said, who previously taught part time at some colleges and a high school. Plaxco said he’s looking forward to getting to know his students, but he also shares a feeling many of them likely are having right now: sadness that summer break is over.